Pokémon Chronicles is a TV series comprised of the English-dubbed versions of a number of Pokémon TV specials. Many of the episodes are from the Weekly Pokémon Broadcasting Station show in Japan, but it also contained The Legend of Thunder! and shorts from the Pikachu's Winter Vacation series. 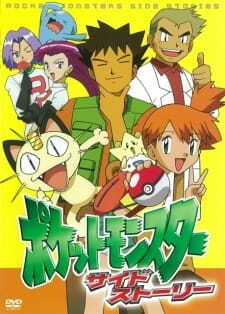 The series, in each episode, basically focuses on the lives of the many of the recurring/main characters Ash Ketchum met on his journey, like Sakura, Misty, her sisters, Casey, and Tracey. Ash only makes two appearances in the series in brief cameos. Ok the enjoyment score is high, I'm a pokemon nut and I'm not ashamed. If you're reading a review for chronicles then you probably know what pokemon is and have a good idea about whether or not you'll like it. But here's the clincher; an entire series of pokemon with no ash/satoshi whatsoever! I know, great right? anyway that's why this series earns a respectable seven. I honestly don't know what to think of Pokémon Chronicles. It's a great idea to have side-stories on secondary characters that we don't get in the main series, and it would've been nice if they had kept this going in later seasons. However, what was good about the series tended to be overshadowed a bit by the bad, and that nearly ruins Chronicles for me. Maybe it's because I expected a little more out of it because it wasn't part of the main series, but the thing about Pokémon as a whole is it's not the best idea to have “high hopes”. After all, I'm not the target demographic (though I think it's safe to say no one here is), what I personally would like to see is not something that could fly in a franchise geared towards children, or at least not fly the way I want. I've come to consider Chronicles as the “awkward tween” of the Pokémon series, and I say that because it seems to appeal to a specific group of fans without getting out of its “kiddy”, or “advertising” stage in this case. It wants to fit in, but it doesn't know where, let alone how to balance it out. A better way to describe it is this is a “testing the waters” entry, to see if a well-known show like Pokémon can still stand on its own without its name and face, Ash Ketchum (and Pikachu), being the main focus. Luckily it does, but not without its problems—most of which get fixed in future specials. Story (6): It's hard to pin-point what the “story” is for Chronicles as not all of it is connected. Sure, there are recurring characters, but each episode deals with a different adventure, or conflict that needs to be solved. For instance, in one episode, you may have Brock fighting with his mother for the rights to the gym, while in another, you got Misty wanting to get new gym badges from a cranky old guy who makes her and her two companions with her work for them. And then in another batch, you may have the recurring villains kidnapping Professor Oak for information on PokéRus, and in the next episode, Ritchie's going back in time to help save an old Pokémon Center. So Chronicles is a little unique in that you can technically watch any of these episodes out-of-order because, well, they're side-stories. You can pick any episode, and you have an equal chance of liking it, or disliking it. Unfortunately, some of these stories sometimes fell short of the potential they set up in the beginning. Some of the better-received episodes are “A Family That Battles Together, Stays Together” and the three-parter “Legend of Thunder”, and possibly “Training Daze” for delving more into the Team Rocket trio's past (although I feel like that one retconned something or whatnot), and one could consider those the highlight of the series. Others like “A Date with Delcatty” and “Those Darn Electabuzz!” weren't so well-liked due to being boring or a missed opportunity, although there's a fan for any episode. Art/Animation (7): As Chronicles was most likely in development when Pokémon moved to digital, and it debuted alongside the beginnings of Advanced Generation, the animation and digital coloring thus reflects the same style as Advanced Generation. Colors are bright and lines are clean with the animation quality being the same as that from the show, though in some areas, it's reminiscent of Mewtwo Returns' animation (which was a TV movie/special, so slightly higher production quality). The best-looking Chronicles had gotten was “Legend of Thunder”, although that's not really saying much, to be honest. It's fair for its time, but it's nothing special. With that said, the dub is just awful here, and it's distracting. It's odd how 4KIDS slipped on this one—it's probably understandable given the circumstances at the time (this was dubbed just as 4KIDS' contract was expiring, so it may not have been them at all who did the scripts and voice-directing), but the script was terrible—whether it was directly translated or not—to the point it didn't feel like 4KIDS. Even the voice-acting was a step down from the main series, with some awkward line readings and lack of passion in some areas, although this is probably a more personal issue as there were times where I got uncomfortable with Rachael Lillis' voice, and Mike Pollock as the narrator just didn't sound that great. (He's a great voice actor regardless, being Pokémon's temporary narrator just wasn't his brightest highlight.) Cassidy had a new voice actress for this series, Andi Whaley, and while she's not that bad, she's no Megan Hollingshead. Kerry Williams as Casey had to have been the worst voice-acting in the show (not counting tertiary characters). I'm sure she's okay when properly directed and casted, but I never found her charming as Casey even in the main series, so whoever did the voice-directing had to have brought out her worst here. The soundtrack comes mostly from the 4KIDS archive, ranging anywhere from the movie soundtracks to those from Totally Pokémon or 2.B.A. Master. I'm sure music from the original soundtrack still remains like the main series, but they don't stick out to me as much, interestingly enough. The theme kicking off the series is “Pokérap GS”, but mainly the “P-O-K-E-M-O-N (Party! )” and “Gotta catch 'em all!” portions with Mike Pollock giving a very, very brief tagline as to what Chronicles is. It's short, but it's... kind of cringe-worthy to watch and listen to. But damn that beat, I fight to keep from bobbing my head to it every single time. Characters (7): I cannot deny that Chronicles was a fresh entry to the Pokémon anime (even if the debate of it being canon or not seems to be a thing in the fandom), and part of that freshness is because Ash isn't the main character. His absence didn't take away from the rest of the cast that were featured, giving them a chance to stand on their own, and that's part of its charm. One-shot characters do exist in this series, however, Chronicles is more like a reunion than anything. Some of them had more screentime than others (whether they really needed it or not), but while some of them I personally never cared for even if they have pleased other people, it's clear the characters are who carried the series along more than anything. Then there's the factor on whether-or-not the characters had some kind of development—something Pokémon's not really known for. In some areas they appear to have character development (although this is rather subjective), but most of the time they were the same as when we first met them. Brock, Misty, and Tracey, for example, got a little more to their character in this series (yet this does depend on the episode they're featured in), but they're still the same Brock, Misty, and Tracey from when we last saw them in the main series. Ritchie and Casey were the worst offenders in not changing at all, but this is not counting Butch and Cassidy who were actually regressed as characters to fit Jessie, James and Meowth's roles—despite the trio being in the series as well. To be frank, I doubt anyone really “grew” in this series, and I'm not sure if that was really a good thing or not considering the series is more-or-less a fanservice show. Considering just about every single recurring character here has at least one fan somewhere in the world, it's safe to say that liking or disliking a character is purely based on personal preference, and there really is something for every Pokémon fan. If all one really cared about was just seeing so-and-so again, that's fine, and was probably the objective of that episode all along. Enjoyment (6): It was tiring to watch, I'm not going to lie. I love Pokémon, I really do, but this felt more like a chore than it should have been. Do I regret watching the series? Well, that depends. It was nice to get episodes with characters I never thought I'd see again, and there were plenty of good ideas that were to be had, whether they delivered or not. However, there was still some repetition (even as a side-project, it still couldn't escape the formula), and some episodes had issues whether it was because of a poor script, or time-constraints (“Celebi & Joy” is my least favorite episode of the series—I found it makes Pokémon 4Ever look better in comparison), and you can't really help that. You're not always going to get a three-parter to make for a decent Pokémon adventure, and even if an episode comes off as a bad filler, there was always at least something to it that was an interesting inclusion. It's not a rewatchable series in my opinion, just something there on the side in case you're curious enough to take a look before moving on. And because it's more of an optional series and not so much a “must-see”, it does come off as a waste of time with some of the episodes nearly intolerable to watch dubbed. As a Pokémon fan, however, I would like to see as much of the anime as possible, even if only to say I have seen it, thus I did set aside time to watch an episode or two almost every day or for that week. After finishing it, I found it didn't take away anything, but it didn't really add much either. And that is more disappointing to me than it is frustrating. I wish they would have carried it on. I bought this by mistake, because I thought it was the box set of the first series or something like that. I was disapointed to start with, but I grew to love it. The two best episodes (We're not heroes and Training Daze) focus on Team Rocket, away from Ash. What's great is you get to see the backstory to everything in the main anime. In Training Daze, it's the story of how James/Meowth/Jessie met at Rocket HQ. James is hilarious in it. We're not heroes! shows a completely different side to them, and it's strangely emotional. But I really love it. Pokemon is more or less the same with Ash doing the same thing over and over again, getting 8 gym badges and losing the pokemon league just to do the same thing in every new region. I can't complain too much because really Pokemon is just to show what your favorite pokemon does in the wild. But this show is something I really like, it shows what the more memorable characters like Misty who left after Johto, Richie and a few new faces. I guess maybe it was that it was the same Pokemon formula just in a different setting and maybe if was just that fact that it was what the pokemon anime could have been for that stuck with me but I really do recommend this to any fan of the pokemon anime.